The globe and maps at the orientation podium help visitors determine where the Manasquan Reservoir is. The information leads the visitor from Planet Earth right to the Reservoir’s location in Monmouth County. Monmouth County’s geologic history is revealed in a replica of a local stream. 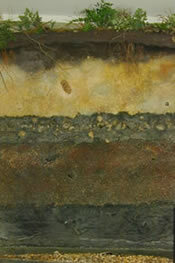 Erosion has exposed a cross-section of soil and the fossils trapped within it, some of which are 74 million years old. This area went through many physical changes as the sea level rose and fell several different times during the earth’s past. Visitors can learn how fossils document these changes. This exhibit also includes a case of fossils that encourages closer inspection. 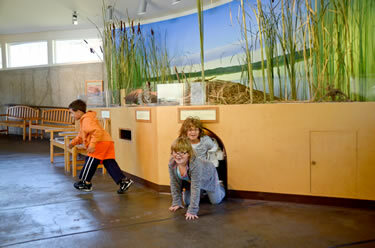 Visitors explore the living arrangements of the muskrat as they crawl through a muskrat tunnel. They see the inside of a muskrat lodge and the nursery chamber of these unique creatures. Other animals with a similar need for water use many of the same materials to build their nests or homes. These wetland-nesting sites provide protection from many predators. 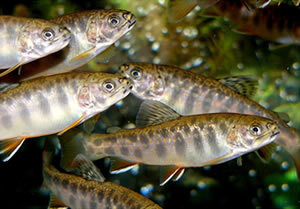 Visit our brook trout as they grow from eggs to a size suitable for release into the nearby Manasquan River. Trout present from October to late summer. Our eagle cam is a great way to view the goings-on at our Bald Eagle family's nest.